Our latest Project Gutenberg eBook release, produced with the help of the Distributed Proofreaders project, is Leslie’s Loyalty by Charles Garvice. This is the third Garvice title we have worked on, following Wild Margaret and The Spider and the Fly. 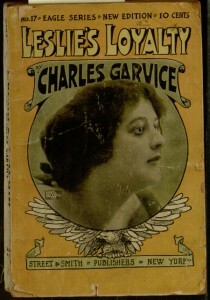 Leslie’s Loyalty seems to be a fairly typical Garvice romance, with an irresponsible but good-natured upper class hero, a beautiful but poor heroine, and some melodramatic complications to delay their eventual union. There aren’t as many unusual plot elements as were found in The Spider and the Fly, but there are mix-ups and misunderstandings enough to fuel a screwball comedy. This is no comedy, however — in spite of some humorous moments, it more often aims for a tragic tone. As in Wild Margaret, the author’s prose holds a certain charm that goes at least a little way to offset the conventionality and absurdity of the plot. Perhaps it’s the tongue-in-cheek snobbishness of the narration, or the fact that the story makes an effort to paint nearly every character sympathetically; whatever it is, there is a certain intangible quality that helps to explain how these novels were best-sellers in their day. In case you’d like to form your own opinion, the entire book can be read online or downloaded through Project Gutenberg.